HATFIELD, UK, Mar. 01 /CSRwire/ - More than a third of us wear a uniform at work. The problem with that is, as with most garments, when uniforms reach the end of their life they are merely tossed in the bin. 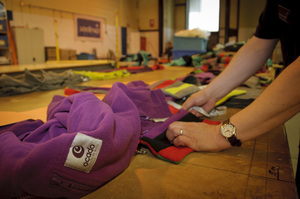 In fact, a staggering 90% of the 33 million corporate garments given to staff every year end up in landfill. That adds up to 15,000 tonnes of clothing. The cost of waste disposal alone comes to £1.2m in Landfill Tax.